Glare from the rising sun had botched my photo efforts on the first two passes. This would be our third and final pass. If we were going to escape the glare we’d need to creep within the mountain’s shadow– and that meant we’d have to fly in close. Really close. 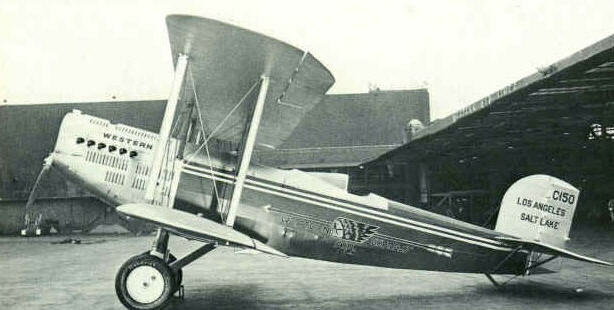 A Western Air Express Douglas M-2 bi-plane used for Airmail in 1926 (source unknown). The following originally appeared in the July 8, 2010 edition of the Tooele Transcript Bulletin. “How’s your head?” Brian Staheli asked as he piloted the Cessna Super Skylane in a low loop over the Great Salt Lake’s southern shore. I figured my airsickness was the last thing Brian needed to worry about as he executed a highly technical maneuver. Moreover, we both had jobs to do. His was to safely position the aircraft over the extreme northwest tip of the mountain range; mine was to spot our target on the ground and snap a decent photo. Glare from the rising sun had botched my efforts on the first two passes. This would be our third and final pass. If we were going to escape the glare we’d need to creep within the mountain’s shadow– and that meant we’d have to come in close. Really close. Brian made a tight turn over Lake Point and flew northward, hugging the Oquirrh flanks. I popped my ears and steadied my camera. 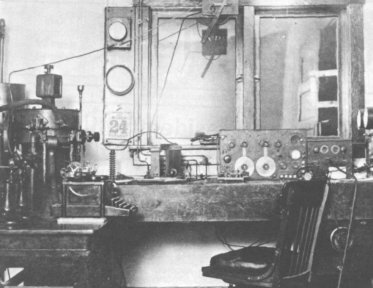 Salt Lake City Air Mail Radio Station, March 1925 (photo courtesy FAA). Many private aircraft owners fly for recreation. Far fewer, I imagine, take to the skies for historical reconnaissance. 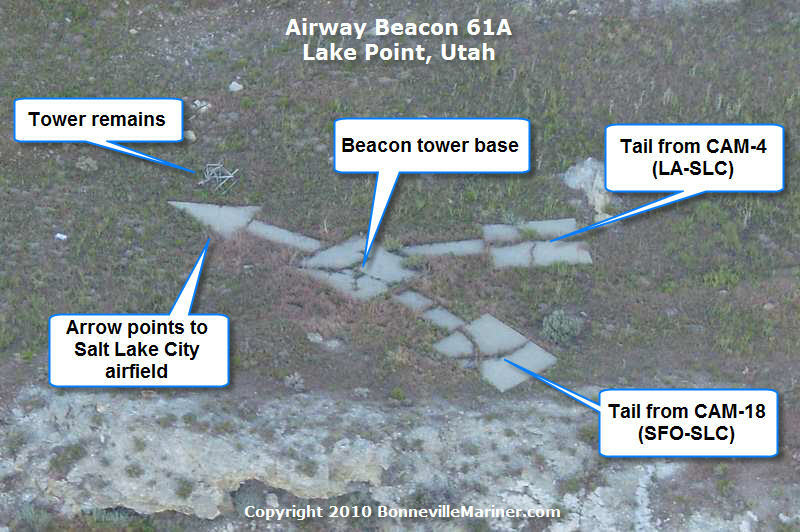 Our target that morning was a rare piece of aviation history—a 60 foot array of concrete slabs situated atop an Oquirrh bench in the Lake Point area and arranged in the shape of a double-tailed arrow. Aside from a certain mystique, the large northeastward-pointing arrow shares another characteristic with phenomena like crop circles or the ancient Nazca lines of Peru: it was meant to be viewed from the sky. Brian brought this fascinating structure to my attention in 2008. A corporate pilot and a flight instructor, he had noticed the arrow while flying around the Oquirrhs. We did some research and identified the structure as a relic of an era less celebrated, but every bit as adventurous as the Pony Express. The story begins in the early days of powered flight, when open-cockpit airplanes were equipped with only a compass and an altimeter, and pilots used railroad maps as navigational charts. Seeking to speed up delivery service, U.S. Postal Department introduced the U.S. Air Mail system in 1918. This new class of delivery service had a definite cool factor, but it was wildly inefficient—mostly due to the fact that flight was restricted to daylight hours. That changed after an experimental flight in 1921, when pilot Jack Knight completed a night flight from Chicago from North Platte, Nebraska, guided by bonfires lit along the way by Postal Department employees and helpful farmers. 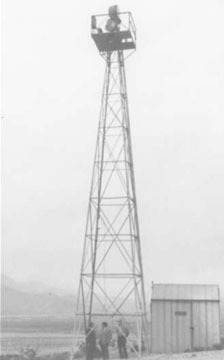 Beginning in 1923, a system of tower-mounted light beacons was installed along the Transcontinental Air Mail Route, which connected New York and San Francisco via airfields that included Salt Lake City. 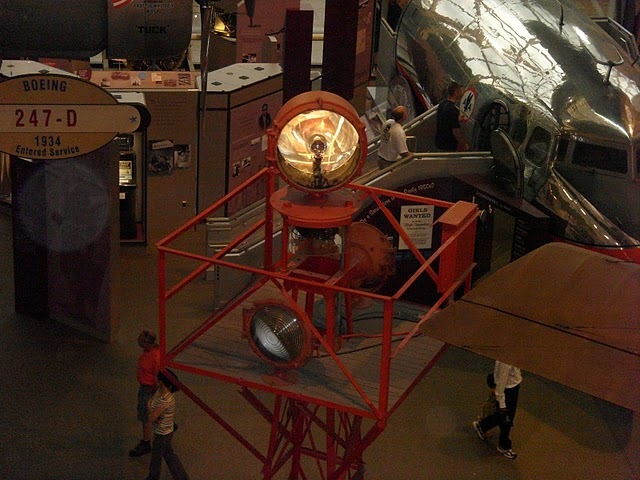 Airway beacons were placed at 10 mile intervals and featured rotating million candlepower lights (photo courtesy FAA). 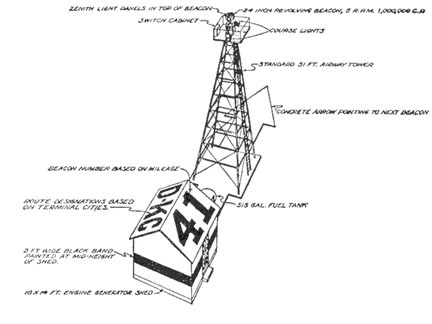 The 51 foot tall towers were placed at 10 mile intervals and each was topped by a 1 million candlepower rotating lamp that was visible within a 40 mile radius. Two additional color-coded course lights pointed up and down the airway and flashed a Morse code letter that identified the beacon. 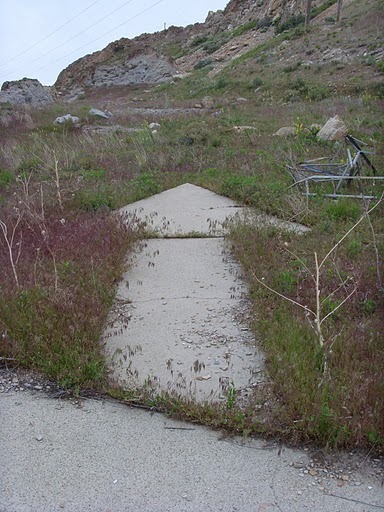 To enhance daytime navigation, most beacon towers were built atop large concrete arrows, which pointed in the direction of the next beacon. This arrow/beacon system grew exponentially when the Air Mail Act of 1925 required that Air Mail service be contracted out to various commercial airlines. Contract Air Mail (CAM) routes were established along the Transcontinental backbone. Salt Lake City became a major terminal field along five CAM routes, with 11 beacons housed in Tooele County. Information on our Lake Point beacon site was scant—not even the Smithsonian Institute’s National Postal Museum could track down a construction date, though they estimate it was placed sometime between 1923 and 1925. Sadly, all we know about the beacon is its official designation of “Airway Beacon 61A,” which it probably received during a 1934 revamp of the routes. 61A is unique in that it marked the junction of two CAM routes to Salt Lake City from San Diego and San Francisco—hence the arrow’s double tail. The arrow is located on property owned by Rio Tinto. Van King, a Rio Tinto asset manager, accompanied Brian and I to the site last month. There we noted the tower’s four steel footings set at each corner of the center slab. The tower itself had been cut away with a torch at some point, and its twisted remains lay beside the concrete array. Traces of orange paint on both the concrete and steel provided an idea of coloration. There were no signs of the beacon itself. A standard airway beacon setup. When possible, beacons were powered by a small generator shack built at the arrow's tail (photo courtesy FAA). The anatomy of Airway Beacon 61A. There is no evidence of a generator shack (photo by Clint Thomsen). Airway Beacon 61A's arrow from the ground with the remains of its beacon tower visible just to its right (photo by Clint Thomsen). Just how long Airway Beacon 61A serviced the routes is unknown, but most of the network’s 1,550 plus beacons had been phased out and dismantled by the early 1970’s. Walking along the concrete “Y” shape was like stepping back in time. And while it was satisfying to see the structure up close, the adventure wouldn’t be complete without experiencing it the way the original air mail pilots did—low and slow from the air. I tried to picture the Cessna with primitive controls and an open cockpit as we climbed from the runway in Erda. We explored the Great Salt Lake and the Saltair area before the sun rose high enough to illuminate the beacon site. My head didn’t start seriously spinning until our third pass, but it was mind over body when it came to the mission at hand. “I’m going to put you right over it,” Brian said before executing an uncoordinated flight aptly referred to as a “slip,” which rapidly dropped us to 50 feet above ground level and gave me a square-on view of 61A. Whether I got the shot or not, it was time to pull out and touch back down in Erda. King says Rio-Tinto is intrigued by the history of the arrow and is reviewing ways to protect its cultural value. 61A may be just a concrete slab, but it’s a slab pilots like Brian hope to fly over for decades to come. Special thanks to Rio Tinto/Kennecott and Brian Staheli.